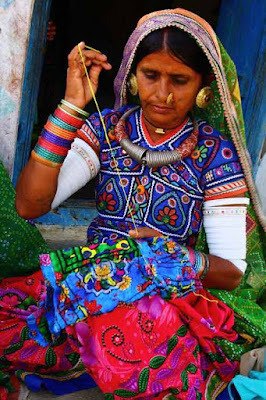 Gujarat state in India has developed its own distinctive embroidery styles, techniques, and designs. The inspiration often comes from Hindu religion and the local flora and fauna it is the case with the Gujarati embroidery. Here is a look at embroidery of Gujarat and Hindu influence. Gujarat is well known for its rich embroidery patterns. Kutch, Saurashtra, and other parts of Gujarat have evolved distinctive styles. Children wear embroidered costumes from early life – caps, kurtis and trousers. Cholis – blouses of women, odhanis – skirts and veils, shawls and leather shoes are delicately and intricately embroidered. The Kathis of Kathiawar, the Rabaris and the Lohanas of Banni have evolved their individual styles. Abhala embroidery, consisting of small pieces of mirrors, is common to all articles of Gujarat embroidery. Preference for a dark maroon color background is a characteristic of the Rabari embroidery, which is often combined with appliqué work. The Jatas and the Mutuwas from the Banni area use fine handspun cotton as base, and embroider it with red, white, golden-yellow, blue and black silk threads. The Mahajani embroidery in Bhavnagar, Saurashtra is renowned for its fine satin shimmering effect, obtained by means of satin and herringbone stitches. The chain-stitch is the most common, often combined with stem, herringbone, button hole, darning, satin and other stitches. Saurashatra and Kutch are also known for bead embroidery. Cradles, coverlets, hangings, pelmets, purses, etc., are embroidered with multi-hued beads. The use of Sindhi taropa (interlacing stitches) shows the ingenuity of Gujarati women embroiderers. Bootis and dots are the commonest pattern. Aribharat embroidery common to Kutch is done by using Ari – a hook and silk threads; kanbhi-bharat is done with cotton threads by using darning and herringbone stitches; moch-bharat exemplifies leather embroidery done by cobblers. Earlier, local satin gaffi and satin silk were use in lieu of leather. Apart from personal garments, Gujarati homes too are decorated with embroidered toranas (festoons) hung on the main entrance; wall hangings, known as sthapana; caklas (square fabrics for covering furniture); candravas (rectangular wall hangings). Local flora and fauna feature prominently in Gujarat embroidery as well.